Speer has been a significant force in the 9x19 ammunition market for a while now, and the Gold Dot series has been a signature item. It has been loaded in several of my EDC and home-defense pistols for quite some time. 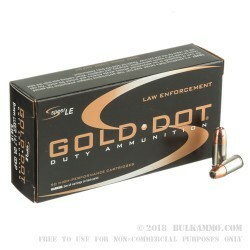 The signature gold dot, located in the center of the hollow point bullet, it the tell of this fine ammunition. 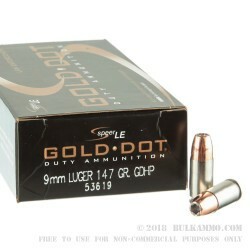 What exactly set Gold Dot apart from other, comparable jacketed hollow points? The manufacturing processes. Gold Dot is manufactured to retain nearly 100% of its weight upon impact and during expansion which tends to provide a much more rapid and reliable dispatch of the threat. Speer’s Gold Dot 147 grain JHP in 9mm is a standard weight bullet, which is the just about the heavyweight bullet in 9mm pistol loads. This is considerably heftier than the two industry standard weights of 115 grain and 124 grain. 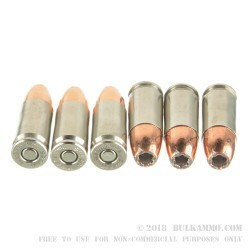 The heavier bullet tends to produce lighter felt recoil, but it is at the cost of lower velocity and energy. Muzzle velocity from a 4” barrel is 1,210 feet per second for 115 grain, 1,150 fps for 124 grain, and then dropping off steeply to 985 fps for the 147 grain bullet. 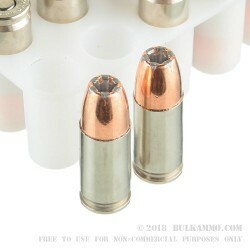 Muzzle energy is considerably higher with light bullet with the 115 grain producing 374 ft. lbs; the 124 grain produces 364 ft. lbs, and the 147 grain bullet is way down at 317 ft. lbs. So if the velocity and energy are both that drastically diminished, then why go with the heavy projectile? Sometimes there's just no substitute for mass. If I am carrying and there is a threat of dangerous animals, I’ll always take the heavier bullet. More bullet mass is more bullet to expand, which leads to a bigger wound channel. Speer has a well-earned reputation among the shooting community of producing a good, reliable product which does its job very well. This is a product which you can safely depend on with your life, although we all hope it never comes to that. Try out a box and see the difference for yourself.